→The entire world of traffic is broken up into these four categories. The entire world of traffic is broken up into these four categories. I had an aha moment this week. I've been talking to a lot of fresh new entrepreneurs via coaching calls. And something has started to dawn on me. They don't really understand the world of traffic! You know...that really important thing that actually makes people see your stuff? Sales are tough without it. So I pumped out a YouTube video today. This picture is the gist of what it was about. 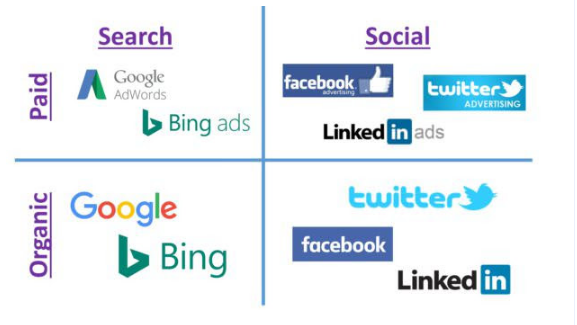 And too many marketers are marketing on social the way they should on search, and vice versa. If you don't understand the left column, paid is when you PAY places like Facebook, Google, etc. do show your ad to their audience. Organic is when you work to make something show up without paying, which is great, but usually takes time and effort. Search marketing is all about solving problems! They have a problem and are searching for a solution. If you can get your solution in front of them, make it simple enough to easily understand, and within their budget, you're good to go! You don't need to convince someone looking for a mattress to buy a mattress right? Social is another ball game. People don't get onto Facebook looking to have their problems solved. They get on looking to turn off their brain and not think. Which means you gotta go BIG. You have to interrupt that and get them to start actually taking steps. So. Much. Harder. Aye, aye, aye. Your business lives or dies on traffic. The best offer will crash and burn without traffic. Soooo... I know you're sitting there wondering what to do with all this info? So here is your action step. Head over to Udemy (world's cheapest high-quality courses) and pick a traffic source you want to learn about.